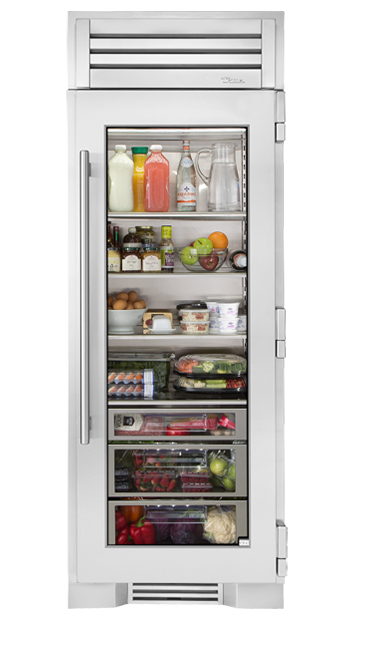 T​he True 42 is more than a meticulously designed refrigerator. The True 42 is an aesthetic indicator, a material good, a value statement. The kitchen designed around the True 42 is a kitchen designed with conviction and exacting standards—in other words, it’s the kind of a kitchen a professional chef would design for his own home. For years, we gathered feedback from the design community, world-renowned chefs, and demanding homeowners. Then, we crafted the first full size True residential refrigerator and, in the process, redefined the concept of the luxury appliance. ​The 30” Refrigerator Column offers homeowners the freedom to design kitchens that look the way they want and, as importantly, reflect the way they live. Paired with a 30” Freezer, a 30” Wine Column, or even with one of our side-by-sides, the 30” Refrigerator Column means complete control and complete freedom, and for homeowners and designers alike, that means complete luxury. For serious collectors, for the hospitality-minded, and for those who simply love knowing that their favorite varietal is always at-hand, the 30” Wine Column is without peer. Boasting intuitive dual-zone True Precision® Control, full-extension smooth-glide racks, and gentle TruLumina® LED lighting, the 30” Wine Column beautifully preserves, protects, and shows off up to 150 of your favorite bottles. Offering 15.1 cu ft of freezer space, the 30” Freezer Column is the most flexible, functional, and unique True freezer to date. Perfect for large families and regular hosts, the Freezer Column is sized to fit into any space and to perfectly preserve all the proteins, produce, and party goods you could possibly need. Capable of producing 70 pounds of clear ice per day—more than any other residential ice machine—the True Clear Ice Machine is designed to handle every entertaining need. A True product to be proud of, it’s also an appliance to feel good about: with an industry-exclusive Energy Star certification, it uses less water and energy than any other clear ice machine in the industry. Adding even more flexibility to your space, True Undercounter Freezers provide a way to store your frozen items where you need them. Both door and drawer models are UL-rated for outdoor use making these units the ideal addition to your home, both indoor and out. Keep your favorite vintage in pristine condition with True’s refrigerated Wine Cabinet. Meticulously designed to preserve and protect wine, the True Wine Cabinet eliminates harmful light, fluctuating temperatures, humidity, and vibration. No other wine refrigerator combines the sophisticated technology and elegant look of the True Wine Cabinet. The True Beverage Dispenser is handcrafted to give you The Perfect Serve. Ideal for the beer connoisseur and for those who love to entertain, this draft beer dispenser uses our exclusive airflow technology, ensuring a consistently frosty, refreshing pour. Single or dual tap, indoor or on the patio, your True Beverage Dispenser will serve you—and your guests—well. The exceptional craftsmanship of True Residential products is evident in the attention to detail and the styling of the True Beverage Center. With True’s exclusive balanced refrigeration system, you can set the temperature as low as 33°F, keeping your drinks icy cold. With rapid cool-down and complete temperature control, we make sure that your drinks are ready when you are.